TANGLEWOOD will be released on 14th August 2018 on SEGA Mega Drive (obviously…), Windows, Mac, and Linux! Oh, we have a trailer, too! It’s all very exciting and terrifying! Thank you to EVERYONE who has followed this journey so far. It’s been so weird looking back through the earliest posts on this blog, back to when I was struggling to add two numbers together! It’s been a wild ride. 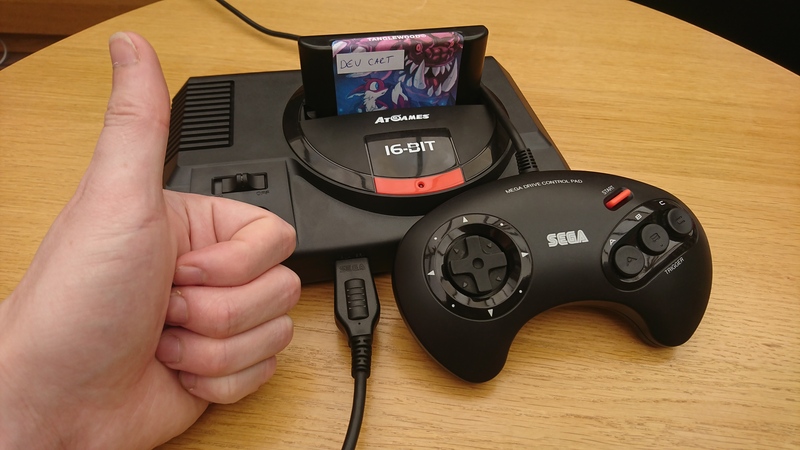 Moving on from the – thankfully almost resolved – troubles of the AtGames Firecore, my QA team and I continued running through our stash of other weird and wonderful Mega Drive clone consoles, when once again we were rudely interrupted by the postman with another AtGames machine. You can thank our friends over at Bitmap Bureau for this one – the makers of Xeno Crisis, another successfully Kickstarter funded game for the world’s greatest videogame console. We’ve been pooling our resources together to help our projects along, and they’ve sent us an AtGames Flashback HD to play with! TANGLEWOOD fired up in complete silence. No intro theme, no menu UI sounds, nada, until we started the sound test and noticed that PCM sound effects and PSG sound was working. FM emulation was DOA, then. At least the PSG was in tune! It was probably sensible to assume that we’d have to start over with our diagnostics, since the system is completely different from the Firecore so none of our previous findings would be of any use. We gave those special registers a quick poke just in case the manufacturers had carried over the concept for convenience, but there was no response. Cracking open the case to look for clues immediately revealed an unexpected aide – the board was straight-up sporting a mini USB port! Since it’s an Android based system, and we are wishful thinkers, we hooked it up to ADB to see if would respond, and to our surprise it did, root and all! A quick Google search showed this wasn’t new information (should have looked there first…) and the machine has already had a bit of probing from the SEGA fan community, but unfortunately it was all related to getting more games on the machine; nothing revealed anything about the emulator powering its games, and no sign of any other games suffering from the same problem as ours. We dumped the whole flash to poke around with and closed it back up. The first thing to check was if any of its built-in games had been modified to work around any issues. With the flash dump to hand we were able to extract the ROM files, and started firing each one up in our modified megaEx build to log any unknown register pokes or other out-of-the-ordinary behaviour. Unlike our Firefore diagnostics, this unfortunately showed nothing. The next thing to check was if any other games in our library suffered from the same issue. Popular games probably would have shown up in Google results if they had compatibility problems, so it was wise to start with some lesser known titles. We have quite the collection of homebrew carts! We tried things like Daytrip, Escape 2042, and some feature test carts, which all worked, but Miniplanets was silent! Miniplanets and TANGLEWOOD share a common denominator: they both use the Echo Sound System from Sik – a rather superb Z80 driver for music, SFX, and PCM playback for the Mega Drive. Echo also comes with its own test program called Echoster, so we fired that up, and verified it suffered from the same issue. Luckily, Echo is open source. Unluckily, I’ve never touched a line of Z80 assembly in my life, and those of you who already follow my blog will know I stopped writing devblog posts when I got to the PSG chip – I’ve never actually touched the YM2612 either! One 12 hour crash course in Z80 later (thanks, everyone at Plutiedev!) and I was totally not ready to track down a bug in a language I barely knew, on a chip I barely knew, on a clone I barely knew, at 3 o’clock in the morning. The first issue was figuring out how to debug anything on the Z80, since it has limited ways with which to communicate with the 68000 – it would require some sort of status byte or command queue to send data back to the 68000 to display info on screen. With limited time, I needed some debug output – or at least some way to identify if a particular line of code had been hit – available from the Z80 itself. It’s capable of sound output, so how about some sound queues to tell me if a condition was met? It’s primitive, sure, but it does the job. With a PlayPiano routine written, I got a piano note when interesting code was hit! Jog on, printf()! From there I was able to determine which parts of the codebase were being executed within Echo, and check some assertions – the initialisation, instrument loading, and note on/off routines were all being called. One thing I’d noticed was that once my debug piano note had played, all subsequent Note On events from that channel also triggered the same note, which meant that the AtGames was fully capable of producing sound output from Echo, but the instrument data didn’t seem to be written (or overwritten, after my piano had been loaded). On a genuine Mega Drive, this code ran silently. On the Flashback, it played a piano note. Interesting. 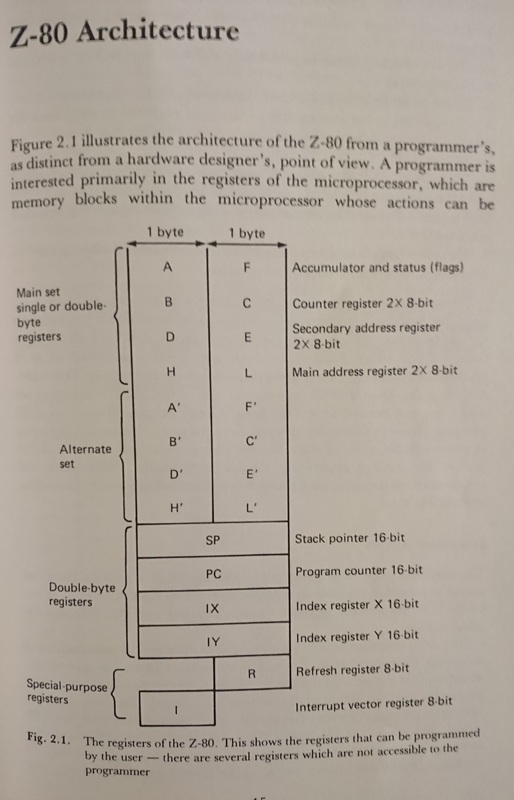 For those who have been following along with my assembly adventures, this should be quick to explain – the Z80 has a bunch (actual terminology) of 8-bit registers used for arithmetic and counters, and a handful of 16-bit registers used for addresses. 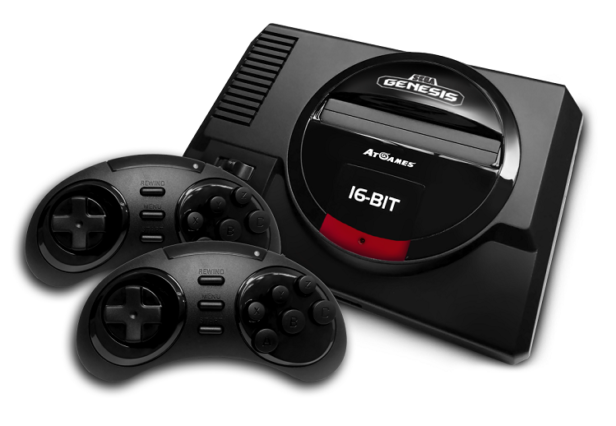 The 16-bit registers have pairs of 8-bit counterparts allowing access to the upper or lower byte. For example, IY is a 16-bit register, IYH allows access to the top byte (IY High), IYL allows access to the bottom byte (IY Low). This keeps $40 in the upper byte of the IY register for the entirety of the program, and the lower byte is set to $00, $01, $02 or $03 when needed, depending on the channel being accessed. Easy! TANGLEWOOD now boots up with the main menu playing, and all is well! Almost. Once again, the SSG-EG feature of the YM has not been emulated in this machine, resulting in the same screeching and whining as the Firecore when playing notes configured with it. During the Kickstarter campaign for TANGLEWOOD, I made a very big promise – that TANGLEWOOD would run on just about every SEGA Mega Drive console, clone, emulator, and home arcade setup available. A golden rule I’ve been throwing around was “if it runs Sonic 2, it will run TANGLEWOOD” – no problem, since the game doesn’t perform any demo scene-style tricks or timing sensitive manoeuvres, nor does it rely on any hardware quirks or undocumented features of the various chips involved. It’s a big and ambitious game from a design perspective, but as far as pushing the hardware goes, I backed off a bit in order to uphold my promise of compatibility. This proved quite a challenge, then, when once fateful afternoon the postman knocks on my door to deliver a box of goodies for our QA team to get busy with – some 6-button controllers from various third party manufacturers, a white label flash cartridge with SD slot, and an intriguing little black box with “At@Games” written on the front. 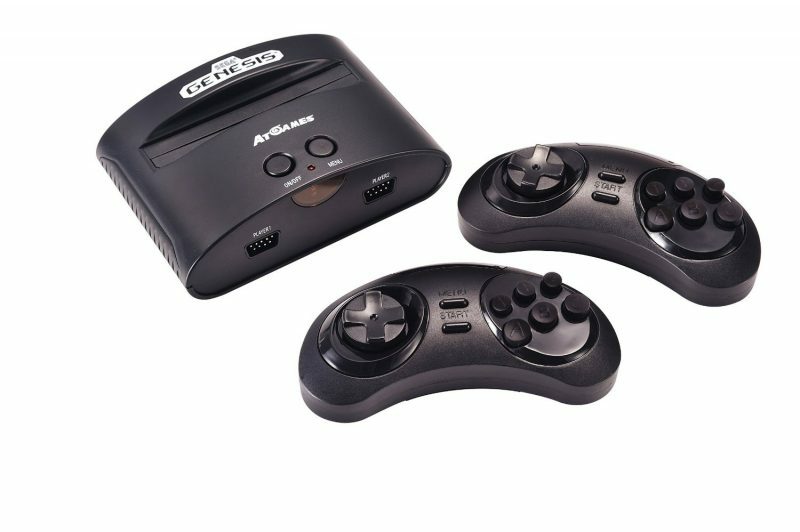 It was the first AtGames Mega Drive model that was sold en-mass here in the UK at our Argos stores – at its heart was AtGames’ Firecore technology. I’d had previous experience playing Streets of Rage on this thing in a noisy gaming cafe in Nottingham. The hustle and bustle of the venue did a good job of hiding the Trojan inside the little horse – its horrific audio. Just how bad was it? I didn’t believe the tales depicting it as the worst console ever released, since the Internet loves its hyperbole, but in this case everybody was right. All of the audio is pitched down, at differing values between FM and PSG, and there was some horrible screeching when some parts of soundtracks played. TANGLEWOOD was shocking. It sounded like a horror game – dreary down-pitched FM, twisted PSG slides, and high pitched screeches where there should be PCM samples. I have a promise to keep, so I’m not taking this lying down. Some quick searching around revealed that the menu ROM has already been dumped by a team of Russian hackers over at emu-land.net. The ROM seems to make use of 128kb VRAM mode, writes to ROM space, and pokes some addresses outside the usual Mega Drive range which crashes most emulators, but I’ve been working with megaEx (my fork of Mega by Lee Hammerton and Jake Turner) which happily executes broken code, instead logging to file anything it doesn’t understand. As expected, the graphics were garbled, but by pressing buttons I could hear the menu navigation sound in the background, so all was well. Simple enough. Latch 0x0, write 0x02620 to what seems to be the FM frequency register in the AtGames machine, un-latch 0x0. The example 0x2820 provided by the Russian folk didn’t seem to be quite in tune, 0x2620 sounded closer. The PSG was still very out of tune, and there was still harsh screeching from some notes, so we needed more. I modified TANGLEWOOD’s sound test screen to include an address poker – an address (starting from 0xB00000) and its current value is shown on screen. Up and Down cycles the address, Left and Right cycles the value, and Start writes the new value. 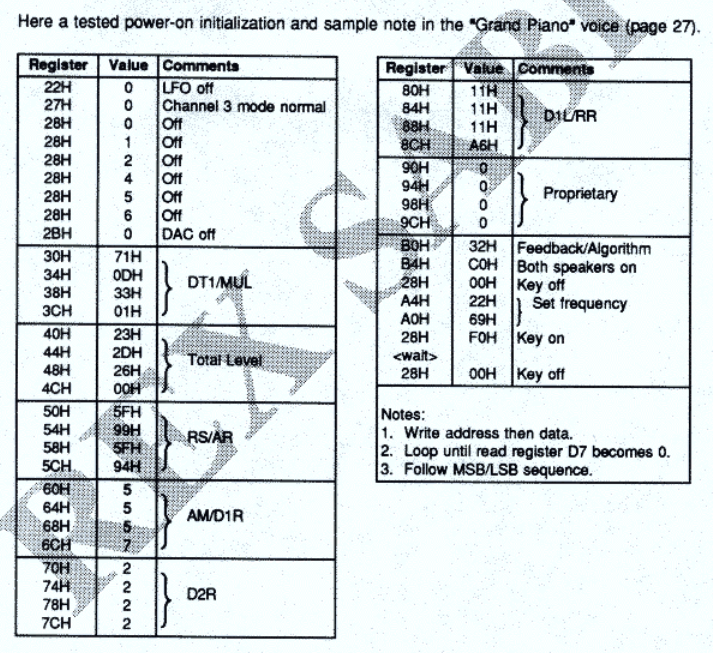 0x00B00018 changes PSG frequency. The bottom 2 bits seem to be a fine tune setting (4 steps), whilst the rest of the byte seems to be a divider (for PSG, frequency*2 = one octave). 0x00B01054 changes FM music pitch, already known. 0x00B01055 changes FM and PSG clock, speeding up and slowing down the music tempo. Using the very scientific method of playing my game’s original soundtrack from a laptop, and listening to the AtGames sat next to it, I settled on the values 0x7A for the PSG freq, 0x26 for the FM freq, and 0x20 for the FM/PSG clock. It’s not 100% done yet. The next step is to fix the screeching sound from some of the instruments. After listening to some of the tracks, I’ve managed to determine that the affected notes all used the SSG-EG mode in their FM operators. It seems AtGames didn’t emulate this properly (if at all), and my only option – without adding more precious time to this – was to disable SSG-EG in all instruments as a test – which worked fine. I’d like SSG-EG on the other consoles, so the plan is to disable SSG-EG on the fly in the audio engine if an AtGames is detected. 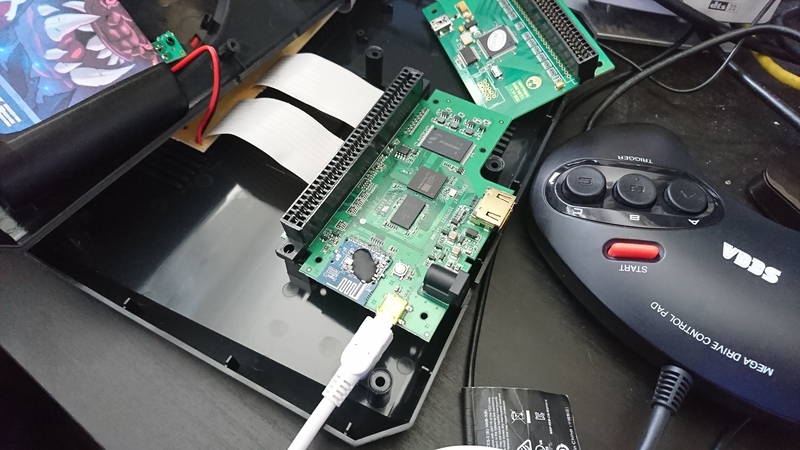 I’ve yet to figure that part out, and so far it’s been easier said than done – reading from any of the AtGames’ config regs at 0xB00000+ hangs up a genuine Mega Drive, and reading from 0x0000 on the AtGames returns the first word of the stack vector rather than allowing us to read back the latch, which means we can’t verify that the latch was written/denied to check if it’s a port. If I get time, I would like to investigate these registers further, and properly document the behaviour of all values written across the range. Perhaps we could fix other issues with this model, so homebrew and ROM hacks will be safe on the AtGames Firecore! Hello! It’s been a long while since I’ve posted a programming article, since I’ve been pretty busy getting my game finished. I’ve uploaded the slides from my workshop at the National Videogame Arcade last year, which details step-by-step the journey to getting Hello World on screen, plus a few extras like memory management, and bonus slides on sprites. You’ll need this pack of resources to go with it. For people trying to get started quickly, I’ve also created a peer reviewed, tried-and-tested on hardware, Hello World sample, all in one file. A fresh demo of Tanglewood has been released, showing off some big changes, brought to you by our newly formed, Kickstarter funded team! 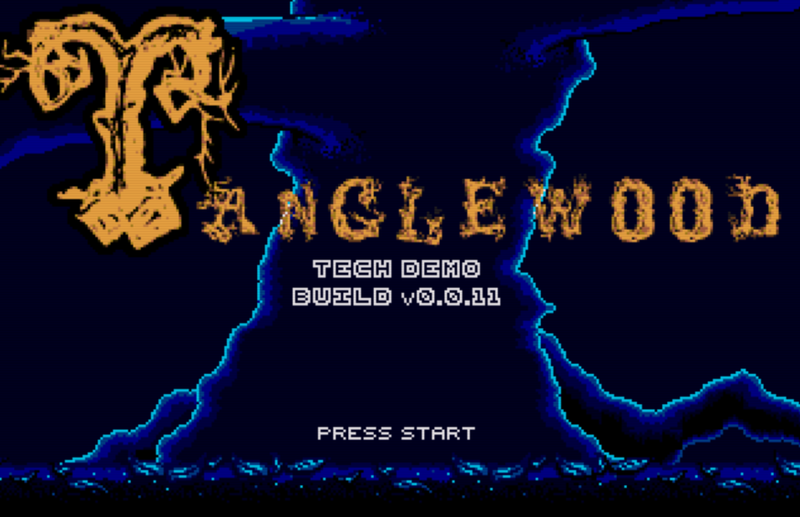 Tech Demo 0.1.04 marks a significant milestone in Tanglewood’s development. We’ve now completed considerable work upgrading the engine, editor and toolchain which will boost our productivity and enable us to realise some big features on our wishlist. We’ve used the updated tools to re-implement most of the existing work to a far higher standard than the original demo, and we hope it shows! The demo is still only a small slice of what’s to come. 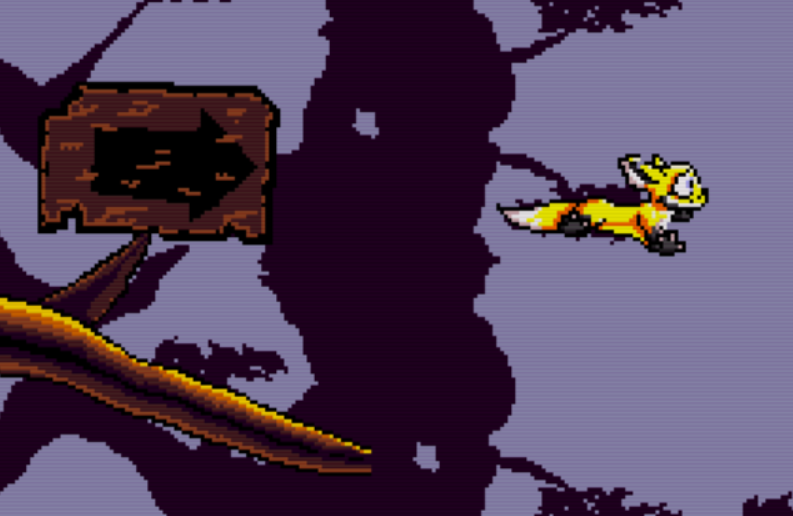 It shows off one of the nine environments in Tanglewood, and only one of the six enemy types we have planned. We have a big bag of mechanics and tricks and puzzles ready to roll out for the other levels, and hopefully we’ll be able to show some of those off soon! We’ll be using our new demo release to drive a promotional campaign to see the end of the Megafounder funding stage off with a bang, and hopefully reach that last stretch goal for the SEGA Dreamcast HD conversion! We’ll be running the continued crowdfunding for around 4 weeks following this release, before we close it down and start counting the materials needed for manufacture. Hey! HEY! Would you like a BRAND NEW GAME for your SEGA Mega Drive / Genesis? Well, it’s happening! 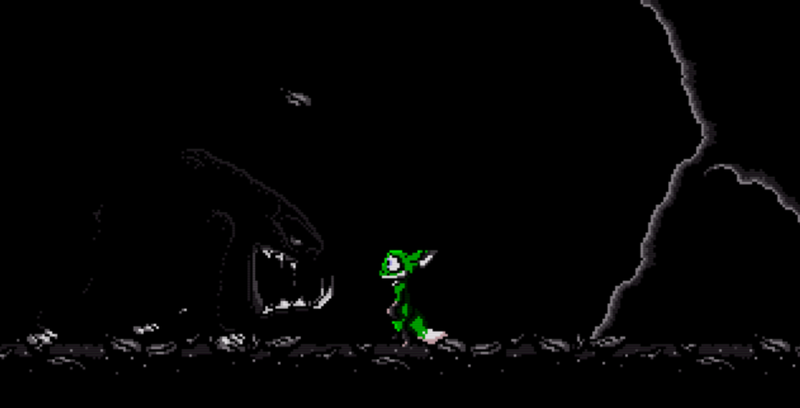 Tanglewood – a new 2D platforming game – is headed to a Mega Drive cartridge in 2017. We need your help to make it possible, though, so back our Kickstarter, follow us on Facebook and Twitter, and tell your friends! I’ll be running a workshop teaching the basics of 68000 assembly language and the SEGA Mega Drive at this year’s GameCity festival! It’s on Thursday 27th October, 11am – 2pm, at the National Videogame Arcade, Nottingham, and will last for around 3 hours. I’m pleased to announce the very first tech demo release of Tanglewood! The demo represents the first milestone in Tanglwood’s development. 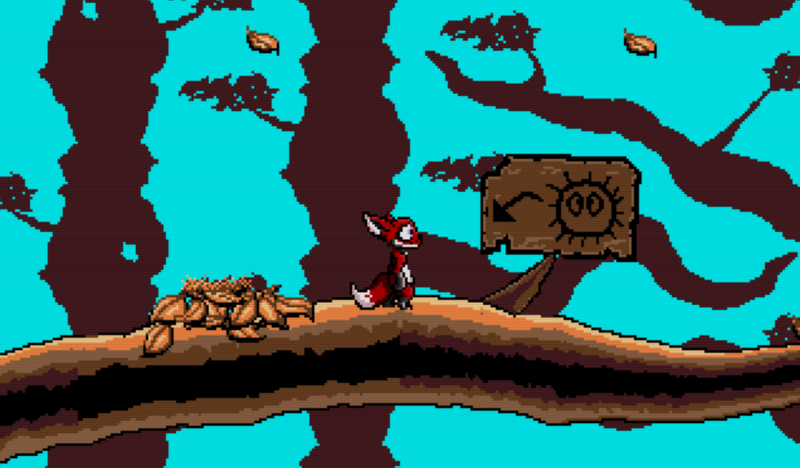 It is a proof of the engine, editor, toolchain and content pipeline, the basic mechanics of the game, controls and platforming behaviour, the art and animation styles, and some early puzzles. 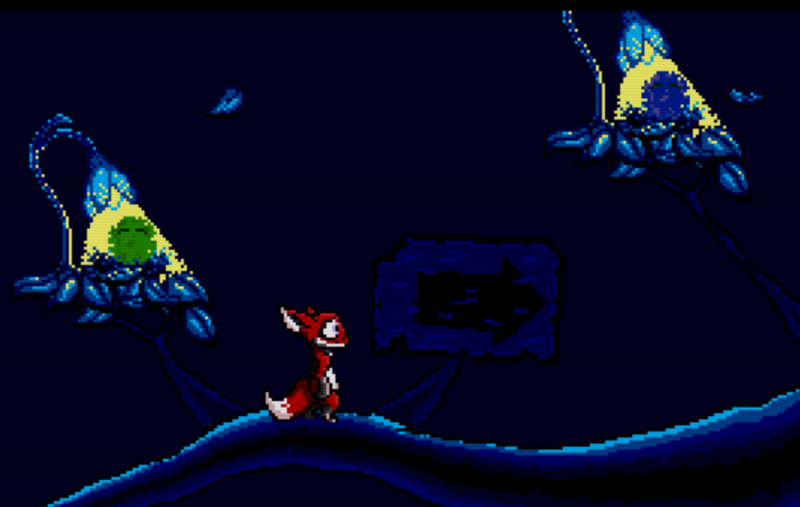 These two levels have been a sandbox for mechanics and puzzle testing since development of the game began, and with a little work they’ve been turned into functional showcases for Tanglewood’s early progress. This is a prototype of a game in its very early stages of development. Some assets are placeholder, and all tech is a work in progress. The look, feel, quality and feature set may not be representative of the final product. There’s a reason our friend Nymn is so keen to get back home before dark. That reason is a huge, snarling, fearsome beast that emerges from its cave at night, with the blood of its last victim still dripping from its teeth, and an insatiable appetite for Nymn’s face. Djakk monsters have been a threat to Tanglewood for as long as its inhabitants can remember. The lore speaks of an ancient tribe of hunters who saddled them up and rode them right to the edge of the forest, hunting the Djunn kind for as far as they could smell. Long gone are the bad rulers of the lands, but their big ugly pets remained. A Djakk fight is a long and drawn out challenge, they are expert trackers and will chase Nymn to the ends of the Earth for a taste of his innards. As the player you must be quick, be forever wary of the Djakk’s presence (however much you think you’ve lost it underneath you), and never underestimate their ability to break through obstacles or foil your traps. They’ve seen it all before. Getting rid of a Djakk will need to be done in different ways for each encounter. In the demo I’ve been working on, a precariously placed boulder is primed ready to drop on the unsuspecting beast’s head, but that’s just a set-up scenario to show off the mechanics quickly. The monster will roar on sight, then immediately give chase, but if he loses you he will wander over to the last place Nymn was spotted to sniff out your tracks. This can be used very much to your advantage, as a way to coax a Djakk into standing on a particular spot – as long as you’re cunning in your escape. I have plans for some of the Djakk encounters to last entire levels, and maybe more. They provide an interesting narrative reason for keeping the forest floor out of bounds until the creature has been defeated. Flues, Fuzzls, and all other tricks and traps inhabiting the surface would be unusable, making whole sections of the game, pickups and secrets inaccessible unless Nymn figures out a way to dispose of his unwelcome companion. More importantly, Nymn is looking for somewhere to sleep to wait out the rest of the night terrors, and with this thing around it’s unlikely there will be anywhere safe to rest. 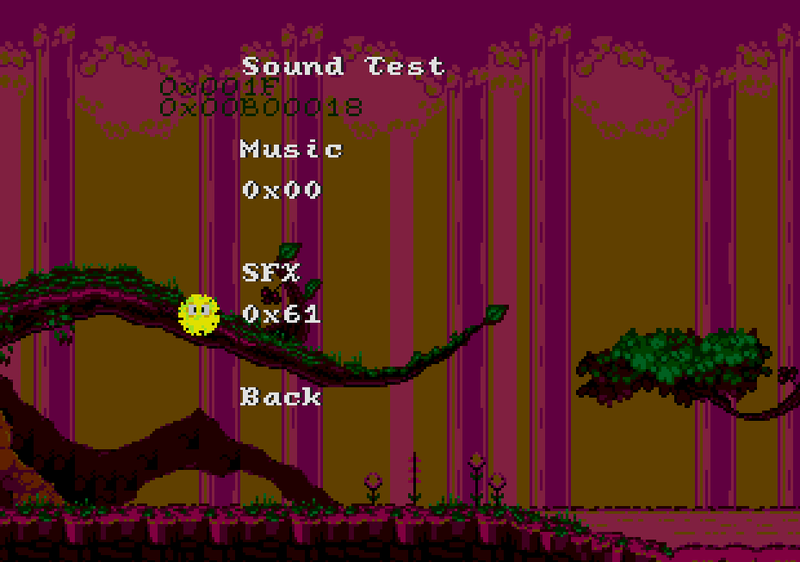 The Djakk posed quite an early technical challenge for the game engine; it’s the largest sprite sheet in the game so far, which is costly both in subsprite count and bandwidth to transfer animation frames. Many of the routines featured in my Mega Drive coding tutorials for sprite management were too slow and naïve in implementation, and it’s taken me quite a while to rewrite them to cope with these huge creatures. The work has certainly paid off, I’m quite proud of our Djakk so far. Future plans for the Djakk include the ability to traverse the terrain, perhaps being able to leap across a crevasse or run up a ramp to reach higher. There’s also the possibility of weak tree branches, both as an added threat to Nynm and an advantageous point to coax a Djakk onto, to see it fall to its death. For the moment we’ll be keeping it simple, this huge sprite sheet is tricky for our artist to maintain, so we’ll squeeze what we can out of the animations available first. Colour is everything in Tanglewood. It is a life force that can be given, shared, stolen, or used as currency. Every animal and plant in Tanglewood has a distinct colour, and that colour may play an advantage or disadvantage to the player. The organic world may respond in a positive manner if Nymn is a matching colour. For example, a length of twisted vines blocking your way may open up for Nymn if you find a way to switch to the same colour, or even move or entice a matching coloured creature to sit next to it. Monsters may behave differently depending if you are a matching or opposing colour, and will either give chase or hang back on the assumption that you are a member of their pack. In Nymn’s case, his colour is his power. Born a red fellow, he can’t do many things by default, but when transformed into a blue, green or yellow creature his world is opened up to bigger and better possibilities. In the previous article I mentioned that the humble little Fuzzls will reward Nymn for helping them back to their nests. A Fuzzl will allow Nymn to take its colour for himself, transforming Nymn to match, and allowing him to use the special ability provided by that colour. This week we’ve been implementing Nymn’s first power colour – yellow. This particular colour gives Nymn the ability to glide over long distances to previously unreachable areas.